During the Revolution, by which the United States became an independent nation, the great majority of the Indian tribes within reach took active part on the side of the British. The Iroquois fought out of friendship, they said; the tribes farther west fought in the hope of keeping the settlers out of the Kentucky, Ohio and Indiana country. For some years after the war, which closed in 1782, there was a dispute between the United States and England over the carrying out of certain terms in the treaty of peace. Until the matter was settled, the British kept Detroit and other American frontier posts. This encouraged the Indians. They had been much astonished and alarmed to find that the Americans had "laid the king on his back." Now that the British had lost the fight, what would happen to them? But the British agents and traders still in the Indian country urged them on to make good their boast that "no white cabin should smoke beyond the Ohio." It was reported that the king was only resting, and that the Americans yet had no right to any land west of the Ohio River. So the Miamis, the Potawatomis, the Ottawas, the Shawnees, the war Delawares, the Chippewas, the Kickapoos, the Wyandots, the Senecas, refused to meet the Americans in council or to bury the hatchet. They formed a league of defense. The Miamis were the central nation. "People who live on the peninsula" was their Chippewa name—for they were Algonkins from the Chippewa and Ottawa country north of the Great Lakes. "Twanh-twanh," the cry of the crane, was their own name. Miamis, from the Chippewa word Omaumeg, were they called in English. They had been described by early travelers as a pleasant-faced, lively, very polite people, slow of speech, swift of foot, fond of racing, and obedient to their chiefs. Their present home was in the Wabash River valley of northern Indiana, up as far as the modern city of Fort Wayne. They claimed this country and also all of western Ohio, where they formerly had lived. The Shawnees and the Wyandots of Ohio had moved in behind them, they said, and were merely tenants upon their lands. Little Turtle, or Mich-i-kin-i-kwa, had become their chief. He had been born on the Eel River near Fort Wayne in 1752. Therefore now at the close of the Revolution he was thirty years old. He had not been born a chief, nor even a Miami. To be sure, his father was chief and a Miami, but his mother was a Mohegan of the Delawares. By Indian law he had ranked as only a warrior and a Mohegan. An Indian was known by his mother. As a boy of eleven or twelve he had been stirred by the Pontiac war, in which the Miamis had joined. As a warrior he had campaigned with the British under General Burgoyne who surrendered at Saratoga. So by his deeds and his experience in field, camp and council he was a veteran and had won the chieftainship of the twelve hundred Miamis. Although his name was Little Turtle, he had nothing little in his make-up. On the contrary, he was of good size, strong and dignified, with a long face and full high forehead—not the face or forehead of a Miami. He seems to have been rather sarcastic, and unpopular. Those were bloody days while the new United States was trying to extend across the Ohio River. A treaty was made with the Cherokees and Chickasaws of the South, and with the Six Nations of the North; one was supposed to have been made with these Ohio country tribes, also. 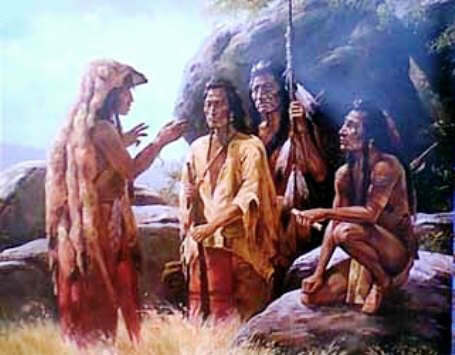 These Indians said that they would do nothing for peace until they had talked with their British "father" at Detroit. They were not sure that the king had really surrendered their lands beyond the Ohio. They asserted that their treaty, by which they had sold their lands, had not been signed by the proper chiefs. In the seven years since the end of 1782, some two thousand American settlers and traders had been killed or captured, along the Ohio River; twenty thousand horses had been stolen. The rifle was more necessary than the ax and plough. The Miami villages on the northern border between Ohio and Indiana formed the base for the many war parties. So in 1790, President George Washington and Congress ordered General Arthur Saint Clair, the governor of this Northwest Territory, to clear the land for the smoke of the white cabins. Little progress had been made by the white settlements, across the Ohio River. There were only two of any note: Marietta, named for the French queen Marie Antoinette; and the newer Cincinnati, christened in 1790 by Governor Saint Clair himself. There were several smaller ones, struggling to live. The governor called for regulars and militia. General Josiah Harmar, the commander-in-chief of the United States army, was detailed in charge. On October 3 he started from Fort Washington, at Cincinnati, with three hundred and twenty regulars of the First Infantry, and eleven hundred and thirty-three militia of Kentucky and Pennsylvania, to destroy the towns of Little Turtle the Miami. Little Turtle of course soon knew all about this. His spies infested the region. He rallied his bands. The Indians whom he commanded—Ottawas, Potawatomis, Chippewas, Shawnees, Senecas, Delawares, Miamis, and so forth—were the same nations that had obeyed the Bloody Belt of Pontiac. He had able aides, too; the skilled Buc-kon-ga-he-las of the Delawares, Blue-jacket of the Shawnees, and others—great fighters, every one. White men, also, were helping him. There were three, especially: Simon Girty, Matthew Elliott, and Alexander McKee, who was part Indian. They were three traitors who had deserted from the American garrison at Fort Pitt, in 1778, and had spread false reports among White-eyes' Delawares, and elsewhere. Serving the enemies of their country, they had continued to live among the Shawnees and Wyandots, and in their savagery were worse than the Indians. Their names are red on the pages of history. In Chief Little Turtle's main village, sometimes called "Girty's Town," located a few miles southeast of present Fort Wayne, Indiana, there was another white man—a young man. His name had been William Wells, but now was Black Snake. The Indians had captured him when a little boy in Kentucky; he had grown up with the Miamis, had married Chief Little Turtle's sister, and was rated as a Miami warrior. But his heart was not bad. General Josiah Harmar, commander-in-chief of the United States army, was a year younger than Chief Little Turtle, commander-in-chief of the Indian army. They both were veterans of the Revolution, had good fighters under them, and might be thought well matched. But the general got threshed. Little Turtle waited for him to come on, and plagued his march with parties of scouts who in the swamps and thickets cut off his foraging squads. The general had tough going, for two weeks. When on October 17 he arrived at Girty's Town, he found it abandoned and burning, to deprive him of more supplies. Then General Harmar made his first mistake. He detached thirty of the First Infantry regulars, under Captain John Armstrong, and one hundred and fifty of the militia, under Colonel John Hardin of Kentucky, to follow the retreating Indians and perhaps destroy the next village. He played into the hands of Little Turtle, who had over a thousand warriors. Colonel Hardin and Captain Armstrong had marched scarcely six miles, when in an open place they were completely ambushed. A swarm of Indians suddenly poured in a heavy fire from the brush on all sides; rose, and charged with tomahawk and knife. This was too much for the militia, who were poorly drilled. Away they pelted, trying to reach the main army. But the well-drilled regulars stood stanch, and met the tomahawk with the bayonet, in the hope of forcing a passage. The Little Turtle warriors cared nothing about the militia, and let them go. The few regulars did not last long. Every soldier except two officers and two privates was killed. Of these two officers, in the break-up Ensign Asa Hartshorne of Connecticut fortunately stumbled over a log and lay concealed until he might escape. Captain Armstrong crouched to his neck in a swampy pond, and stayed there all night, while only two hundred yards from him the enemy held a war-dance over the bodies of the slain. They had whipped the trained soldiery, who had fought bravely. The next day, with all his army General Harmar advanced upon the Miami towns. Little Turtle had ordered them burned. The general destroyed the corn-fields and the fruit-trees; and seeing no Indians to fight, turned back for Fort Washington. He had gone about ten miles, when scouts brought word that the Indians were gathering in their towns again. The general made a second mistake. Colonel Hardin, stung by the way in which his militia had acted, begged for another chance. Instead of going, himself, General Harmar again detached some of the militia—six hundred this time—and sixty of the regulars under Major John P. Wyllys of Washington's old Continentals. He told Colonel Hardin to find the Indians. The colonel found them, on the morning of October 22. His only fear had been that they would run off and not give him his revenge. But he had not counted the strategy of Little Turtle. When the first few Indians were sighted, Colonel Hardin made careful and scientific preparation. He attacked. The Indians did run off, with the happy, shouting militia in full hue and cry after. The regulars followed slowly. When a gap of two miles had opened, as if from the very earth out sprang Little Turtle's whole remaining force, a thousand, and the hapless regulars were in the same plight as before. The militia fought their way back, too late. The battle on the field had become hand-to-hand. Both sides were brave; but when a soldier thrust with his bayonet, two tomahawks were there, to crash into his skull. Major Wyllys was killed; so was Lieutenant Ebel,nezer Frothingham; fifty of the rank and file fell. Only eight men escaped. Of the militia, a major, two captains, and over ninety others died. After he had been joined by the survivors, General Harmar resumed his march to Fort Washington. He claimed a victory, because he had destroyed the Indians' winter supplies; but he had lost one hundred and eighty-three soldiers killed, and forty wounded, and the Indians not more than fifty warriors. The victory and the field of battle were left to Little Turtle. General Harmar had proved to be a commander whose orders were "Go" instead of "Come," and Colonel Hardin had not known how to fight Indians. However, Little Turtle realized that the Americans had other officers, and that General Washington was not a man to back down. There would be another army. So he spent much of the winter in visiting various tribes and enlisting them. He went as far north as Ontario of Canada, and there appealed to the Missisauga nation of Algonkins. He traveled west to the Illinois River. He was a second Pontiac. General and Governor Saint Clair himself was the officer appointed by President Washington to lead the next expedition against the Little Turtle army. He was a gallant old Continental, aged fifty-seven and gray-haired. As a young officer in a Scotch regiment he had come over to America with a British army, in 1758, to fight the French and Indians. After that war he had become a true American citizen of Pennsylvania, and as colonel and major-general had served with the Buff-and-Blue in the war for American independence. "Beware of a surprise. You know how the Indians fight. So I repeat—beware of a surprise." General Saint Clair had been promised three thousand men, but when early in September of this year 1791 he left Fort Washington, he had only two thousand men. Still, it was a strong army, comprising the greater portion of the whole army of the United States. There were the First and Second Infantry, half a. battalion (two companies) of the regular artillery, a company of mounted riflemen volunteers, and six hundred Kentucky militia. Major-General Richard Butler of Pennsylvania, and of the Continental army in the Revolution, was field officer in command; and a number of the other officers had been trained under Washington. But the Second Regiment was new, the last spring, and largely of recruits; and the Kentucky militia had not wanted to come. Part of them deserted, on the way out. The First Regiment was sent to catch them. This left fourteen hundred men, to march on into the Indian country. General Saint Clair was so crippled with the rheumatism and the gout that he could scarcely mount a horse. Twenty miles north of Fort Washington he halted long enough to erect Fort Hamilton—Hamilton, Ohio; twenty miles farther he erected Fort Saint Clair; and twenty miles farther, Fort Jefferson, near the present city of Greenville, Ohio. He was following up along the Indiana-Ohio line, to strike the Miami villages. By the night of November 3 he had arrived within about fifty miles of Little Turtle's principal town. The place on the modern map is Fort Recovery, northern Ohio, close to Indiana. Little Turtle was ready. He had twelve hundred men. Buckongahelas the Delaware, and Blue-jacket the Shawnee were helping him. So was a Missisauga chief who had been drilled under British officers. So was Simon Girty the white-Indian savage. So were a number of Canadians and French half-breeds, from Canada and from the Illinois country. And so, it is stated, were several British officers from Detroit, who wished to see their old foes, the Continentals, licked. Their red coats were noticed in the battle, next day. General Saint Clair was a good soldier, and planned well. He had planted a string of supply depots behind him. He had made a practice of sounding the reveille two hours before day-break, every morning in camp, and keeping the men at parade until almost sunrise, to guard against a surprise. He tried to be thorough. This afternoon of November 3 he had selected an excellent camp ground, from which a few Indians had fled at his approach. It was high, compact, and protected by a creek. He stationed his main body in two lines about seventy yards apart, facing in opposite directions. His scouts had reported that the Indians were collecting in force about twelve miles distant. His intention was, to fortify the camp, so that the knapsacks and other baggage might be left there; and as soon as the delayed First Regiment came in, to push right on and attack. Little Turtle's scouts also had been active. They had surveyed the marches and the camps, had measured the infantry, artillery and cavalry—and had been alarmed by the showing. Here was an old general and some big captains, wise in the art of war. Little Turtle called a grand council of all the chiefs, red and white. They debated whether to attack the camp, or to try an ambush in the field. Little Turtle favored attacking the camp. An ambush would be expected by the old general, but an attack upon a strongly guarded camp would not be expected. A maxim of war says: "Never do what the enemy expects you to do." The Missisauga chief sided with Little Turtle. He was a tall, stout, fierce fellow, very swarthy and severe looking. He wore hide leggins and moccasins; a long blue shirt, a brocade vest, an overcoat instead of a blanket, and a turban studded with two hundred silver brooches. In either ear were two bangles, twelve inches long, formed of silver medals and quarter-dollars; in his nose were three nose-jewels of painted silver. He was respectfully listened to as a wise captain, and he and Little Turtle carried the day. "But the gray-haired general is always ready for a surprise attack." "All right. Wait until the hour when he is not ready. Then strike." Under the direction of Commander-in-Chief Little Turtle, in the darkness this night the Indian army stole forward and was posted with as much skill as any white army. The Miamis held the center; the Wyandots, the Delawares and the Senecas held the right; the Ottawas, the Potawatomis, the Shawnees, and others, held the left. They were ready. They could hear the challenges of the alert sentries, at the gray-hair's camp. Two hours before day-break they heard the drums beating the reveille. The soldiers of the gray-hair were on the watch. The light in the east broadened. Securely hidden, the Little Turtle army waited. They might see the dim tents of the militia advance-guard, camped a quarter of a mile this side of the creek. Beyond, where the main camp was under arms, the smoke of the fires began to thicken. Toward the time of sunrise the soldiers grew tired of standing in ranks. The dawn-hour for surprise by Indians had passed. Trumpet and drum-roll sounded for "Break ranks." Having stacked their guns the soldiers gladly made for their tents, or squatted around the breakfast fires. Another day had begun, without event. Little Turtle allowed fifteen minutes or so, for the soldiers to settle and doze. Then he gave the signal, a half hour before sunrise. General Saint Clair was lying sick in his tent. There burst a distant rifle shot; it was instantly followed by a crackling volley, as from half a thousand rifles—and an answering heavier volley from the muskets of the militia. Struggling to don his blanket-coat he limped out, his gray queue ragged. The camp sprang to arms, for officers and men knew their business; but here came the militia like a drove of stampeded cattle, legging frantically for shelter from a horde of whooping, darting Indians. The militia dived through the lines of the regulars, into the very center of the camp, and for a short period all was chaos. It was a furious fight. Reforming their lines, the regulars stood well. They checked the charge by a thunderous volley from the long-barreled flint-lock muskets—the same as used at Brandywine, Princeton and Yorktown. The strategy of Little Turtle and his chiefs was excellent. They shifted the attack from point to point. They attacked both lines at once. They took advantage of every cover, and constantly appeared closer. They killed every horse and every gunner of the artillery posted in the center. Of the Second Infantry, all the officers fell except two. General Butler hastened bravely up and down the one line, encouraging the troops; General Saint Clair limped heroically up and down the other line. Eight bullets pierced his clothing—a lock of his hair was shorn off. General Butler was shot twice; and while he was sitting, mortally wounded, an Indian rushed in and tomahawked him. General Saint Clair's army was being shot to pieces. He ordered bayonet charges; but when these had cleared a little space, the Indians re-appeared, thicker than ever. Their fire, it is recorded, "was tremendous." The camp was entered, and pillaged. Some two hundred and fifty women, among them the general's dashing daughter, had come with the army; and these suffered terribly. After three hours' battle, the general ordered a final charge, to open a way. Pressing behind the bayonets, the weary troops commenced a retreat of twenty-nine miles to Fort Jefferson. The general, on a poor pack-horse, insisted on bringing up the rear. Out of his less than fourteen hundred soldiers, thirty-eight officers and six hundred men were killed or missing; twenty-one officers and two hundred and forty-two men were wounded. Fifty of the women had died. It was as bad as the defeat of General Braddock's army, in 1755. For a year and a half the field was covered with bleaching bones. Little Turtle, the Missisauga chief and Simon Girty the white savage had directed the attack. After a pursuit of four miles, seeing that the soldiers were on the run and throwing away guns, knapsacks, and all, they called the chase off. It had been victory enough. They had captured seven pieces of cannon, two hundred cattle, many horses; they returned to the villages with one hundred and twenty scalps strung on one pole, and with three pack-horses piled high with kegs of liquor. Their own loss was stated to be fifty-six. Surely this was a great triumph for Commander-in-Chief Little Turtle.